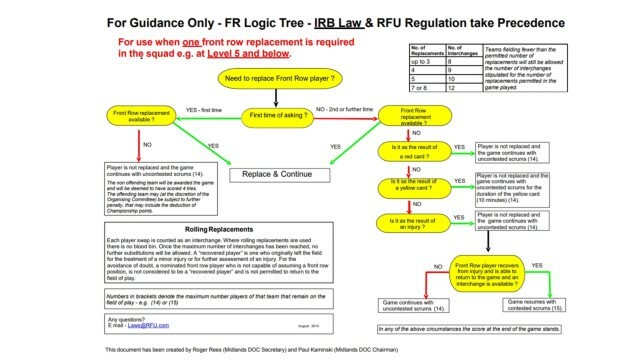 Some of you may have noticed some discussions regarding what happens when a team has to go to uncontested scrummages due to either and injury or a yellow or Red card being shown to a front row player. Unfortunately like with other points of law there seems to be a range of opinions from the sidelines but as the man in the Middle the referee should be clear. This is the scenario that started the discussion. Fortunately the referee on the day got it right. This was a level 7 game (D&N1), and both sides had one front row replacement. Team A substituted (tactically) their tight head in the 1st half. The replacement tight head was subsequently injured in the second half. He was duly replaced by the starting tight head, as per regulations. However, this player (starting tight head) was then sin binned for 10 minutes. The referee allowed Team A to keep 14 men on the field (as it was the 2nd occasion), but went to uncontested scrums. He required both teams to have 8 forwards in these scrums. As you would expect most of the promotions and relegations have been decided but there are one or two that are going down to the wire fixtures left which should provide an interesting end to the league season. Throw in the odd play off and there is still plenty to talk about. Please remember to fill in the score ASAP after the game has taken place. After the meeting the suggested amendments were presented before the Referee Society General Committee on Thursday 12th January for approval. In a change to law, World Rugby has redefined illegal (high) tackle categories and increased sanctions to deter high tackles via a law application guideline. This will apply at all levels of the game from 3 January 2017 introducing minimum on-field sanctions for reckless and accidental contact with the head, effectively lowering the acceptable height of the tackle.The guideline will be supported with a global education programme. When making contact with another player during a tackle or attempted tackle or during other phases of the game, if a player makes accidental contact with an opponent’s head, either directly or where the contact starts below the line of the shoulders, the player may still be sanctioned. This includes situations where the ball-carrier slips into the tackle. We will be covering the CMOD tackle module in our January meeting at Durham City. This month as is the norm we are going to be running our usual training session on the 3rd Friday in November (18th) when the theme/subject matter will be the scrum. 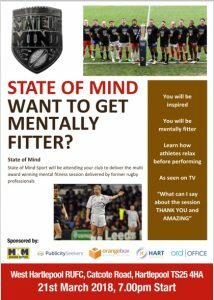 What will be slightly different is that the content of the module and material we will be presenting has been produced by the RFU. This has a number of advantages for us all, not least being the opportunity to build a a personal store of recognised training. 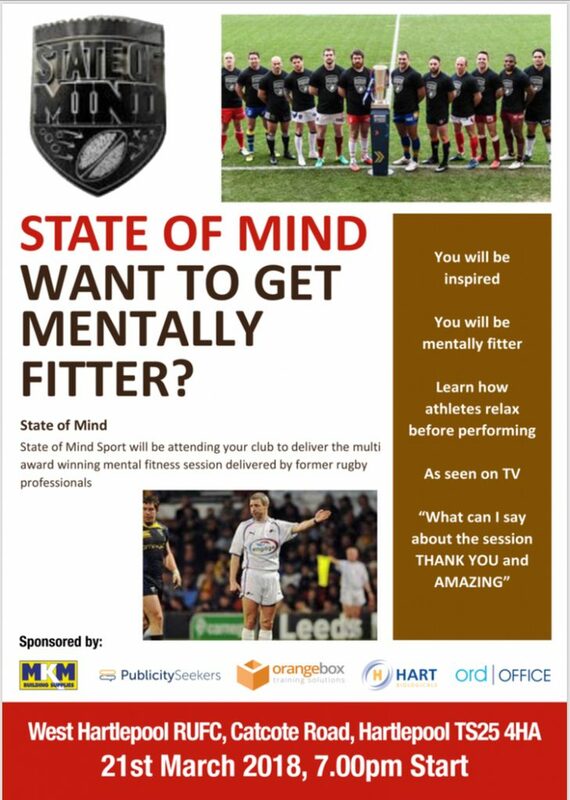 In order that attendance can be confirmed you need to register your intention to attend.